A unique pressing of Sgt Pepper's Lonely Hearts Club Band made for Capitol Records employees has been discovered by an American record collector. Around 100 copies of the pressing are thought to have been made. 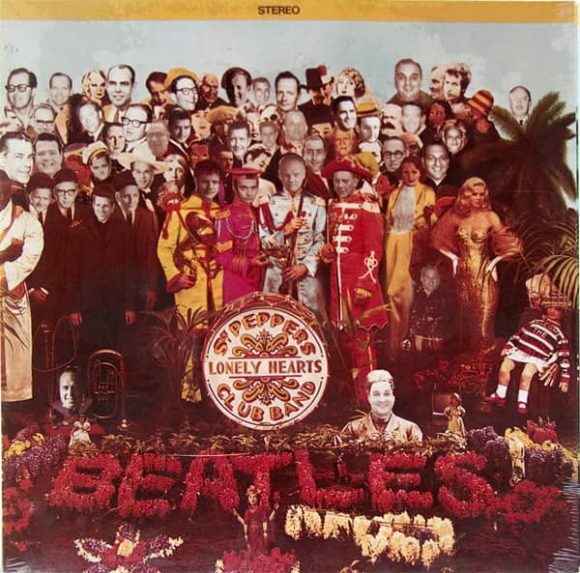 The faces of 40 of the people on the album cover were replaced by those of Capitol Records executives, as a gift to employees of the label. The tracklisting and rest of the artwork are identical to the conventional vinyl version of Sgt Pepper. The record belonged to the seller's late husband, who was an executive for Capitol in Los Angeles. He owned a selection of "mainly jazz and easy-listening LPs," according to collector John Tefteller. "I don't normally go out to look at something like that because I'm not really into either of those categories, but I just thought, 'Well, all right. Capitol Records? Maybe there's something else in there.'" There was. Although Tefteller initially thought the pressing was a standard one, it caught his eye as it was still in its original seal. As I'm going through the LPs, she says something about, 'Well, there's a Sgt Pepper album in there.' I'm like, yeah, okay. And I just figured, normal Sgt Pepper album, no big deal, whatever. It's cute to see one, but they're not particularly rare unless they're like factory-sealed in mono, or something. Or factory-sealed original stereo. They could have some value. Just in general I figured all these LPs look like they're open and used. This is going to be just a standard Sgt. Pepper LP. The seller told Tefteller the album was given to staff at the label, but he originally dismissed it as a fake. I didn't know what it was. I thought, well, maybe it's some kind of fake or repro, but it didn't look like a fake and it didn't look like a repro. So I just thought, 'This is unique.' So based on finding that in the collection, I bought the collection, 'cause she wanted to sell everything. After taking the collection home, Tefteller called noted Beatles collector Stan 'The Beatleman' Panenka, who told him there had been similar versions sold 20 or 30 years ago. None of these have turned up in the last 10 years or so. And from what I understand, doing some further investigation, those copies were fairly well-used, whereas this one is factory-sealed in the original shrink and still in perfect condition. It is believed that only about 100 copies of the Sgt Pepper rarity were ever made. We're only speculating on that. And the reason I say it's a speculation and a guess is: One, there have only been three or four at most that have turned up over the last 30 years. That would lead you to think that there were very, very few of them made in the first place. Two, just in order to have one copy available to each of the people who are pictured on this front cover – and I would guess they would have more than one copy available to them, perhaps as many as two or three – you would be looking at a press run of around 100. In knowing what I know about how records are manufactured and the process that it takes to do that, it doesn't make any sense for a record company, even one as large as Capitol, to go through all the trouble of making up a special cover, printing those covers and then factory sealing them and all that unless you're going to do a minimum of a hundred. With such a rarity, Tefteller had trouble determining a value. However, he negotiated a price with Panenka, who now regards it as a jewel in his Ultimate Beatles Collection.